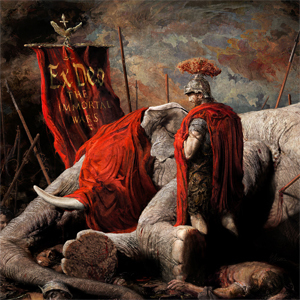 EX DEO's third album The Immortal Wars offers epic tales, melodic death metal riffs and orchestral anthems that will surely raise fists! Prepare ..Defend ...Destroy! Now Italian blooded frontman Maurizio Iacono and his converted Gauls from French Canada send the first strike from The Immortal Wars! Ensure to witness "The Rise Of Hannibal"! It's the first song of EX DEO's upcoming masterpiece and it's available NOW. Listen to the exclusive worldwide audio premiere! Stream "The Rise Of Hannibal" in its entire length below. "Hispania (The Siege Of Saguntum)"
"Cato Major: Carthago Delenda Est!" "Ad Victoriam (The Battle Of Zama)"
Pre-order yourself a copy of The Immortal Wars! The first single "The Rise Of Hannibal" is an instant grat track - if you pre-order the album, you'll get the single as immediate download! Stay tuned for more news to come from your Roman Legion!